← What is a Concordat? Gabriel Garcia Moreno was the President of Ecuador from 1861 to 1865 and from 1869 to 1875. He was well educated – a chemistry professor – unlike most of the Ecuadorian Presidents who preceeded him, who came from military backgrounds. He was about ten years old when Ecuador became an independent nation-state and he witnessed considerable chaos and lawlessness in Ecuador’s early days. There are no common or free schools in the capital… In 1861, French friars were imported3 to teach boys the rudiments of knowledge; but the education of poor girls is still left to private charity. The number of those who cannot read or write must be enormous. Parents are not required to send their children to school; on the contrary, illegitimate children were excluded by an order of President Garcia Moreno, from the schools of the French friars. Besides, the system of education which now prevails is very bad. In the elementary schools nothing is taught but reading, writing, religion, and a little arithmetic. In the higher schools, Latin, and perhaps Greek, monopolize the time of the student. Geography is taught without maps. The natural and mathematical sciences are neglected, and every deference is paid to religious intolerance. As a proof of this, I shall refer to but one instance. For many years, Vattel’s “Law of Nations”4 was a text-book at the University. Several years ago, however, the Archbishop remonstrated against the use of it as heretical, because it advocates religious toleration. It was immediately prohibited, and Bello’s meagre essay5 substituted in its place. But the most serious problem with Garcia Moreno’s presidency was his insistence on concluding a “Concordat” with the Roman Catholic Pope, granting enormous power to the Church in Ecuador. Sydney Z. Ehler, author of “Church and State through the Centuries” -an excellent scholarly survey of Concordats and Church-State relations worldwide down through the Centuries – bluntly states that the Ecuador Concordat was -from the Church’s point of view- “the most favourable ever concluded with any modern State.” For the full text of the Concordat click here and for commentary on the Human Rights violated by the Concordat, click here. …no one was to be elected or eligible [for public office] who did not profess the Catholic religion, and whosoever should belong to a sect condemned by the Church would lose his civil rights. 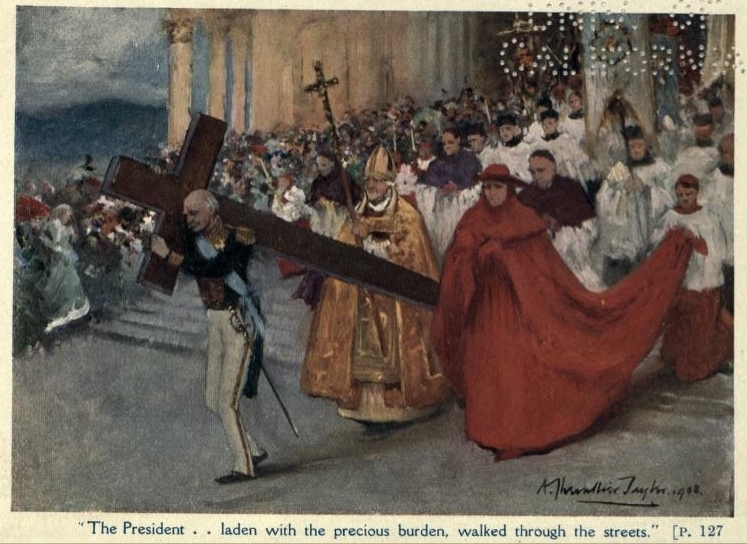 It’s no wonder that Garcia Moreno’s 1869 constitution was dubbed “The Charter of Slavery to the Vatican”6. 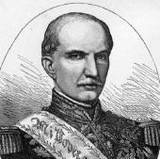 In 1873, after Rome and the Papal States had been taken from Pope Pius IX by the King of a newly united Italy, President Garcia Moreno of Ecuador addressed a note of protest to the Minister of Foreign Affairs of the King of Italy expressing his displeasure. His supporters saw him as “a potent organizer” and “the regenerator of his country” and Garcia Moreno righteously proclaimed “Twenty-five years are needed to establish my system”. This period of “almost a quarter century” refers to the two-decade period from 1875 to 1895. It was in the year 1895 that Eloy Alfaro was first elected to the presidency. This entry was posted in Church and State, Presidents. Bookmark the permalink.